It takes just under 10 seconds to run, but to the winner of Athletics’ men’s 100 metres goes the accolade of “The Fastest Man on Earth”. 100 Metre Men, first published in 1988 as a tie-in to the Thames Television series The Fastest Men on Earth, is reissued in paperback format, fully revised and updated to include the incredible men’s 100 metres final at the London 2012 Games when Usain Bolt won his second gold medal. Each chapter discusses not only the race itself, but also the preliminary rounds, dramas and controversies and includes interviews with all the key players, not just the champion. 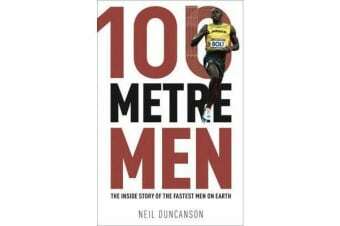 Immaculately researched and written in an entertaining style 100 Metre Men brings to life some of the greatest athletes who ever set foot on a running track.